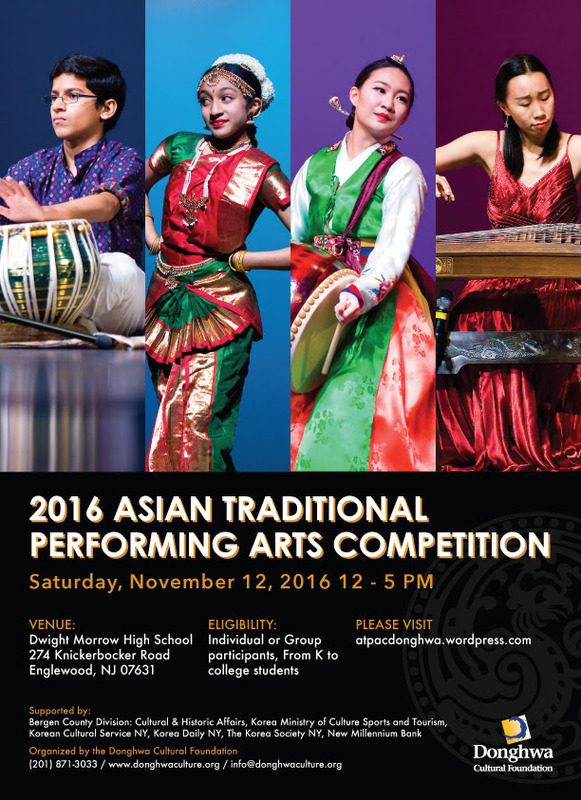 We invite you to the 2016 Asian Traditional Performing Arts Competition! Organized by the Donghwa Cultural Foundation, ATPAC is a special presentation of traditional and classical Asian dance and music that is open to K-12 and college students. We aim to provide a venue that will not only exhibit the talent and effort of our participants but further the promotion and understanding of these various Asian performing arts and cultures. The Grand Prize winner will be awarded an $1000 cash award, with additional winners awarded other cash prizes and certificates. You must use the online submission form, linked below, to register your performers for the competition. Payment and other contact information can be found in our Competition Guidelines. If you are unable to access the online application, and require a PDF form, please contact at atpac@donghwaculture.org. For reference, our mailing address is PO BOX 271, Englewood, NJ 07631. If you have any further questions, please feel free to contact us at atpac@donghwaculture.org or (201) 871-3033.